The monthly collective supports anyone that IS thinking about having a baby, IS actively working towards conception as a (single parent or in partnership), AND is for anyone in pregnancy already within the 1st, 2nd, or 3rd trimester. How can joining the monthly space guide your journey for conception and for pregnancy? The collective is a monthly self commitment that requests you to show up for yourself and your baby. You will get the most updated insights, join an intentional community, expand your understanding of vibrational anatomy of reproduction, build an energetic awareness of spirit baby, and space to receive accountability for building upon your spiritual practice of creation, awareness, love, and healing. The collective is a space that teaches you how to trust your intuition, share your experiences of spiritual connection; It promotes heart-ful practices for conception energy and pregnancy, and supports your opening towards your path into parenthood. Your baby spirit will thank you! Monthly meditation space will be for conception and pregnancy. The energies of conceiving and pregnancy are best friends. The meditations will empower you to receive body awareness; they will support your ability to build up your sensitivity for spirit baby communication, and they will nurturer a trusting relationship with your psychic energy. Why is the group energy valuable? How can creating community intention support you? The group energy is important for being a spiritual being with issues to address. Gain tips upon the journey from conception into pregnancy. Use the power of art & poetry with pictures & mantras. Share your experience on your spiritual journey (Beginners / Advanced). Join workshops & meditations with Guest Experts. Join a consciously conceiving and birthing movement with like minded others. What is Spirituality & Energetics about? It is an in-depth, trusting, loving, and evolving connection of the energetic self for: discovery, mindfulness, sacred body communication, and heart- to- heart spirit baby communication. Unique topics to get insights, create change, and receive support. The Q&A space will be an opportunity to chat LIVE and open up for questions and answers. 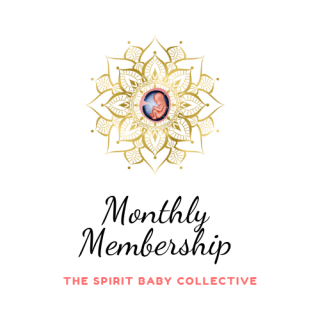 -​ 6 Month Membership includes a BONUS of a 90 minute digital download of free workshop of your choice (Conscious Conception/ Spiritual IVF/ Empathic You). The monthly energy supports anyone that IS thinking about having a baby, IS actively working towards conception as a (single parent or in partnership), AND is for anyone in pregnancy already within the 1st, 2nd, & 3rd trimester. Please READ---MONTHLY MEMBERSHIP GETS EMAILS ONLY WITH UPDATES AND IS NOT ABLE TO JOIN FACEBOOK GROUP. IN ORDER TO JOIN FACEBOOK GROUP FULL 6 MONTH ENROLLMENT IS NEEDED. Conception & pregnancy are sacred spaces that require awareness in order to serve the baby beings that are entering our lives everyday all around the world. The conscious conception relationship between parent and child offers a bond that is genuine and spiritually tuned inward.